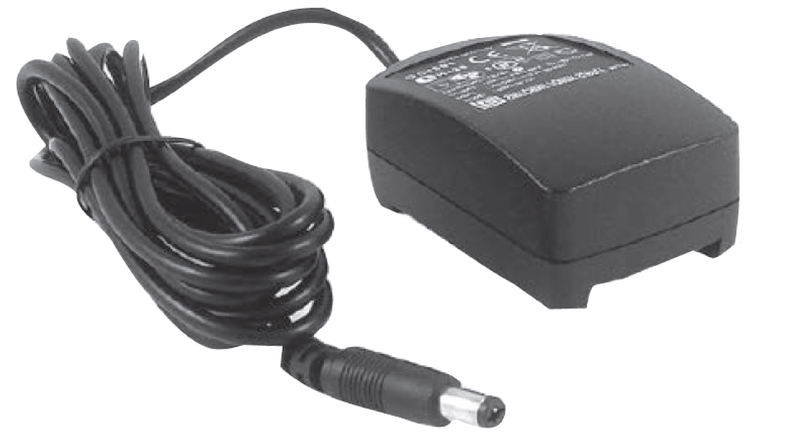 Many Kation-made physiological instruments require an external, 12 VDC power supply. We recommend this good-quality international model which can be used in most countries. You may also consider our DC power cable (Order no. T3006, see below) when more than one of our instruments need to be powered in a daisy-chain configuration (see gallery) using one power supply. This is a cost, space and cable saving solution. Use this DC power cable if you elect to power up multiple Kation-made instruments from one power supply in a daisy-chain configuration (see gallery). It is a cost and space saving solution in an intricate electrophysiology rig. However, the maximum current output of the power supply needs to be kept in mind. This cable is part of the BAB-501 microampere iontophoresis pump kit. Purchase another one if you lost it or the original got damaged. It can be used in connection with any of our previous BAB-500/501 models. The length of the flexible coaxial cable is 36" (91 cm). This BNC/free end cable is part of the Union-series nanoampere iontophoresis pump kit. Purchase another one if you lost the original or it got damaged. It can be used in connection with any of our Union models. Solder an inch long silver or platinum wire on the free central end of it and it is ready to insert into an iontophoresis micropipette. The length of the flexible, coaxial RG174/U type cable (0.1" in diameter) is 48" (122 cm). Reduce your jungle of cables in an intricate electrophysiology setup using small-diameter (0.1" = 2.54 mm), custom-length coaxial cables. They are usable in connection with all Kation-made instruments. Available standard lengths are: 6", 12" 24", 36" (15, 30, 61, 91 cm). Other lengths are also possible. Please replace X in the order number with the required cable length. The ExAmp M2111 headstage probe can be mounted by its 1/4" (6.4 mm) diameter shaft in traditional micromanipulators. The other way is to attach it onto a driven shaft of a microdrive in a stereotactic system. We offer a 19 mm square opening adapter for this purpose in three mounting hole sizes. Please replace X in the order number with the required shaft diameter. SA1525-5 For attaching Kation’s M2111 headstage probe to a 4.8 mm diameter, third party micro drive shaft. SA1525-6 For attaching Kation’s M2111 headstage probe to a 6 mm diameter, third party micro drive shaft. SA1525-8 For attaching Kation’s M2111 headstage probe to our SA1520 drive unit or to other 8 mm shafts. The upper holder part by using a thumb screw can be fixed on a maximum 14.3 mm diameter cylindrical probe. The lower holder accepts a maximum 6.4 mm diameter micropipette or microelectrode assembly fastened by another thumb screw. The two holders can be freely rotated and moved closer to one another on the 4 mm diameter and 85 mm long steel rod. The resulting arrangements allow posi- tioning and holding in place of our single- or multibarrel carbon fiber or glass-insulated tungsten microelectrodes in connection of third party headstage probes. 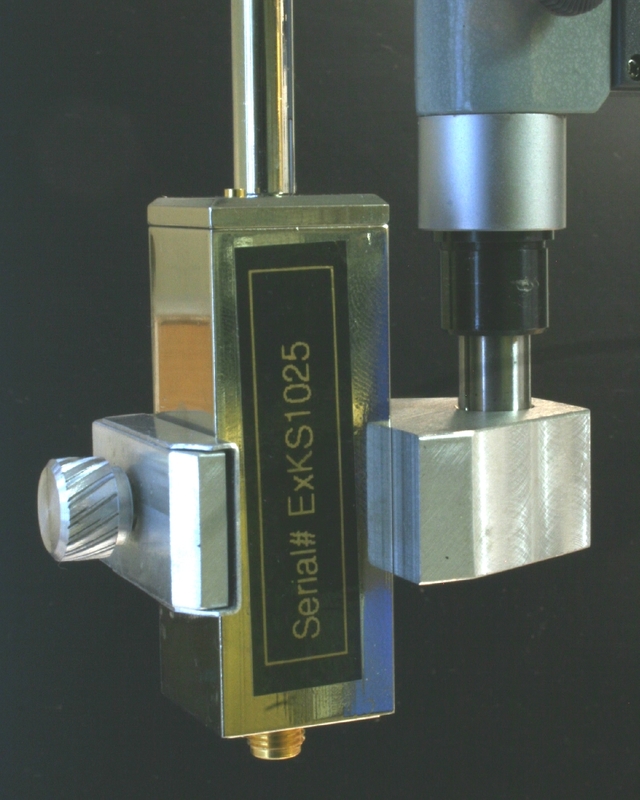 Recommended when you need to use Kation-made microelectrodes with headstage probes other than our M2111 model.